Let's Go tie some stuff down with these 15' tie down straps. Keep your sticks from flying off your ride with the VAMO 15' tie down straps. Made with 1.5mm thick dura soft nylon so your boards stay scratch free without sacrificing strength. The oversized stainless steel cam has been designed so large or small fingers can access it easily and we wrapped it in silicone sleeve to make sure your cars paint job doesn't pick up a few dings while you are playing. It comes with a synch white storage bag so your tie downs stay dry and organized in your car. Holds anywhere from 1-5 SUP's on your car securely. 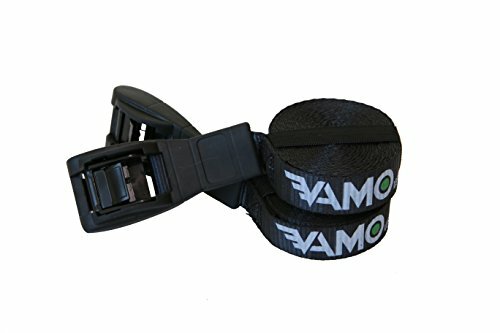 The VAMO 15' SILICONE BUCKLE tie down straps are made with 1.5mm thick dura soft nylon so your boards stay scratch free without sacrificing strength. The oversized stainless steel cam has been designed so large or small fingers can access it easily and we wrapped it in silicone sleeve to make sure your cars paint job doesn't pick up dings while you are playing. Included with a synch storage bag so your tie downs stay dry and organized in your car. Holds 1-5 boards on your car securely. SUPERIOR TIE DOWNS, SECURES GEAR FAST & EASY: These tie downs are designed to ensure that they hold your cargo in place and prevent damage. The premium cam buckle loop tie down straps are designed to hold any load fast, safely and securely. Spend less time securing your equipment and more time having fun! HIGHEST QUALITY, INNOVATIVE DESIGN: Our tie downs are guaranteed not to scratch and damage your boards or vehicle. With the soft silicone buckle cover innovative design, you won't have to worry about any hooks or metal damaging your precious cargo. BUY WITH ABSOLUTE CONFIDENCE - as all our products are stored and shipped by Amazon and are fully guaranteed for one year. If there are any quality issues, we will refunded or replace the straps (your choice).